Phenom Gallery continues to its popular line of officially licensed NHL screen prints with a very special poster celebrating the Edmonton Oilers’ 40th Anniversary! To celebrate this huge milestone, artist M. Fitz has worked with the club on four posters that will be released throughout the season celebrating both the past and present of the Edmonton Oilers. The first print by M. Fitz debuted yesterday, Thursday November 29th, at Rogers Place, and features Oilers greats Wayne Gretzky, Grant Fuhr and Paul Coffey. What’s really cool about this Oilers series of prints is that all four designs can be connected into on huge piece of artwork. The Edmonton Oilers 40th Anniversary Screen Print by M. Fitz and Phenom Gallery measures 18”x24”, comes signed and numbered by the artist, and is limited to just 300 pieces. 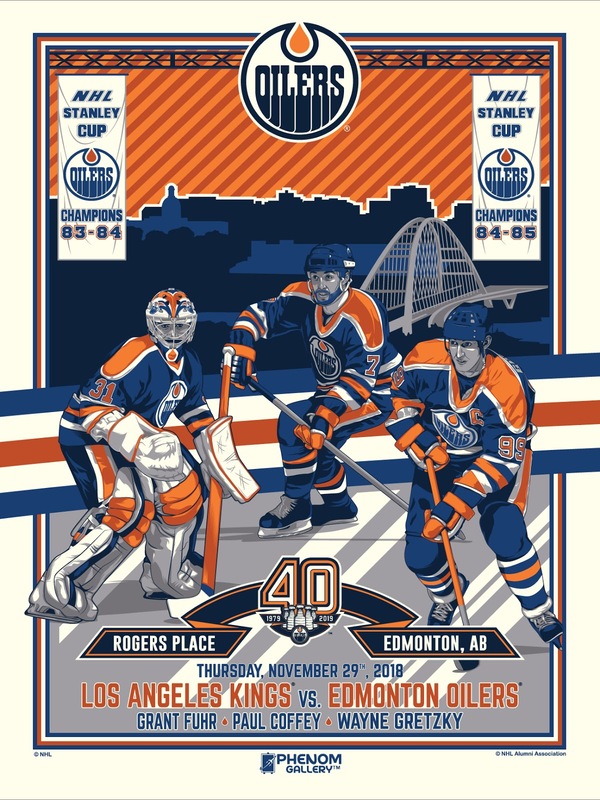 Fans can purchase this 6 color print exclusively at The Oilers Store at Rogers Place for $60.